​Air pollution creates significant public health issues. People over 65 or under 5 years of age, people with heart disease or COPD, and people working outdoors are most susceptible to health issues from air pollution. Ozone and particulates can especially aggravate existing respiratory conditions (like asthma) and create long-term health problems (American Lung Association 2015). Trees can remove up to 60% of street-level air pollution, including carbon dioxide, ozone, nitrogen dioxide, sulfuric dioxide (a component of smog), and small particulate matter (i.e., dust, ash, dirt, pollen, and smoke) (Coder 1996). Charlotte's urban forest removes almost 5.4 million pounds of pollutants from the air every year, a service valued at $6.9 million to the City of Charlotte. Mature Trees Do More. 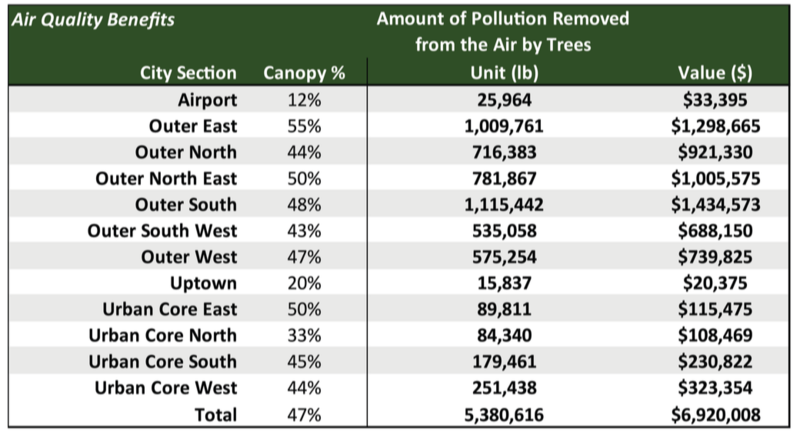 A point to note on trees and air pollution: larger, mature trees provide exponentially more services to clean the air in Charlotte. A 30" diameter tree removes 70 times more pollutants from the air than a three inch diameter newly planted tree. Thus, preservation of existing trees is extremely important to the public health of Charlotte residents. ​The table below shows air quality benefits throughout the neighborhoods of Charlotte. Charlotte's urban forest removes almost 5.4 million pounds of air pollutants every year, a service valued at $6.9 million to the city. A large mature tree, 30" in diameter, removes 70 times more pollutants from the air than a 3" diameter young tree.